Did Leonardo Da Vinci belong to a secret society? Did he leave decipherable clues in his works for the future and is the so called secret 'code'not all fantasy and fiction? Is it true that he came quite close to being burned at the stake for some of his esoteric works? What if answers to all the above questions have new evidence now turning towards a highly probable yes... and if so what was he trying to encrypt secretly? A number of new documentaries claim that a whole range of arcane knowledge about the Renaissance era, which has recently been emerging, is all nonsense. Yes, this widely read book may have some obvious fictitious elements, and fraudulent documents have corrupted the credibility of some of the substantial historical material. Be that as it may, we must seriously ask ourselves whether the inclusion of a single false document, is enough to laugh off a fairly large collection of repeating convincing clues. This hardly seems reason enough to ridicule all further findings on this subject, albeit that they are still in the evaluation stages, and have not yet been fully publicised. Art experts believe this Renaissance artist was responsible for painting a recently 'discovered' work depicting Mary Magdalene semi-naked! They are convinced that the forgotten painting titled ‘Mary Magdalene’ shown below, clearly exhibits Da Vinci’s style and technique, and therefore is most likely a genuine portrait. If you are surprised that this finding has not been given the kind of media coverage that it is deserving of, ask yourself: "Why?" The painting can be easily referenced on the internet from reliable sources. And if it intrigues you as much as it has me, this is a challenge to you to prove for yourself that it is an original painting. Art experts believe this Renaissance artist was responsible for painting a recently 'discovered' work depicting Mary Magdalene semi-naked! They are convinced that the forgotten painting titled ‘Mary Magdalene’ shown below, clearly exhibits Da Vinci’s style and technique, and therefore is most likely a genuine portrait. If you are surprised that this finding has not been given the kind of media coverage that it is deserving of, ask yourself: Why? One might wonder… Is this the face of the woman seated on the right hand of Christ in Da Vinci’s famous Last Supper? Was Da Vinci forced to portray Mary Magdalene in this manner, half naked, so he would not have to endure the wrath of his piers and possibly the law. What law you may ask? This was the era where the Church had the power to influence the beheading of, or burning at the stake, of anyone who threatened the church. Does it suggest that the people of Da Vinci's era, in the grip of what was socially acceptable, were in denial that a woman could have a physical relationship with a man of flesh and blood, who most believe was the creator of the known universe? The significance attributed to Mary Magdalene seems to be only one aspect of the ‘big secret’. 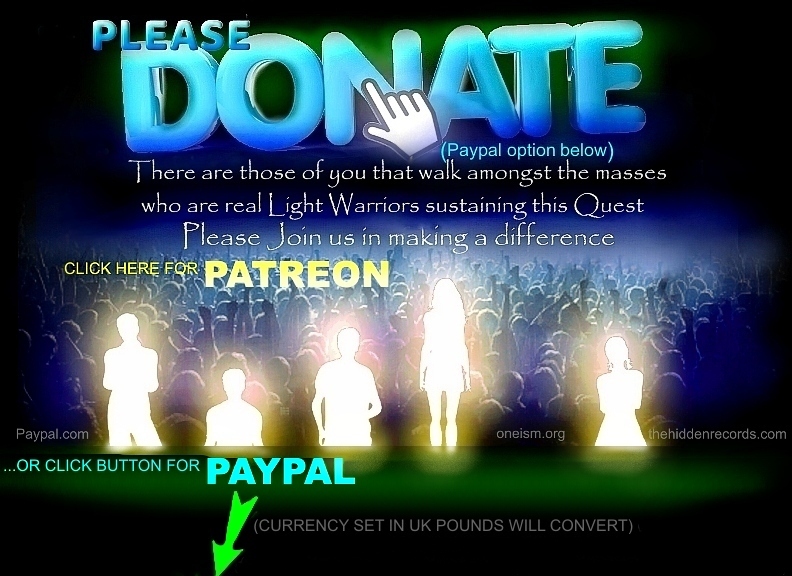 Watch this space for part 2 of a 7 part update story… The human blueprint code that follows has new updating evidence that will prove it conclusively and it will be posted over the next few months. Avid readers of ‘The Da Vinci Code’ by Dan Brown – which has been making headline news for selling some twenty million copies, thanks to the mystery it creates around a legendary hidden code – may not be aware that this ‘hidden code’ is a reality, and the solution is tied in with Stonehenge and the pyramid mysteries. While Dan Brown is keeping his readers in suspense with the promise of a sequel, a new book titled ‘The Hidden Records’, which has been recently published, will reveal all. I am an author in the field of archaeo-astronomy (seen on the highly acclaimed South African television programme Carte Blanche last year) – has just launched this long awaited very controversial book. Not only do I propose a new solution to the ancient pyramid civilisations, but in my research of Stonehenge, I inadvertently stumbled on the Da Vinci human code solution encrypted in this ancient monument. 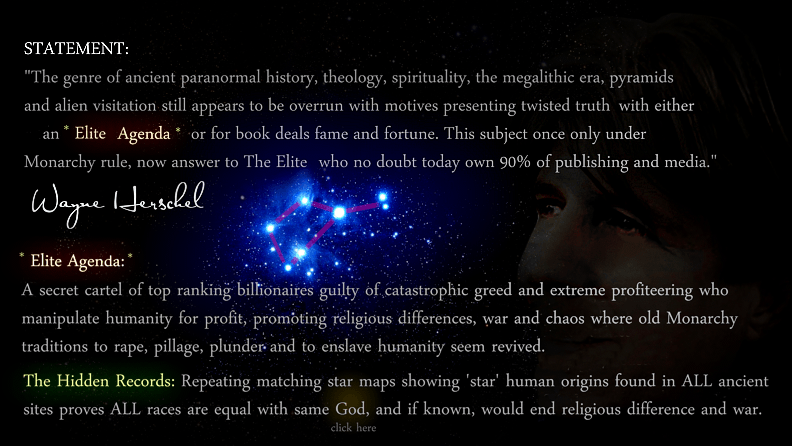 I am firmly of the opinion that Dan Brown’s basic research was very real. I believe Brown chose to apply dramatised fiction around facts as a marketing tool, to make for very exciting reading. 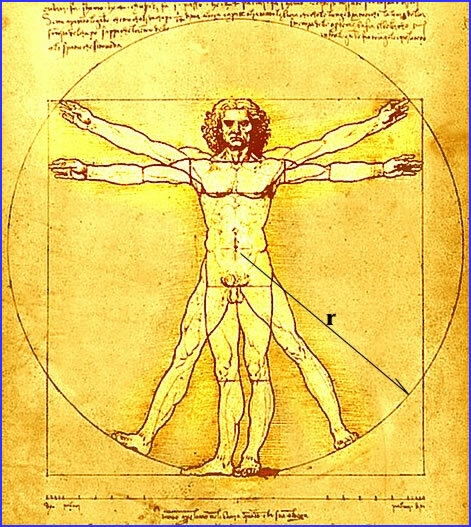 The art piece that I had had the greatest affinity with in my research on Leonardo Da Vinci, is the one that is referred to as ‘Vitruvian Man’ (shown above). To this very day, this great Renaissance artist’s portrayal of the human form has been considered to hold a hidden mathematical code as well as the already deciphered Fibonacci ratio (more commonly known as… the Golden Mean). I believe Da Vinci intentionally left out some ‘secret’ detail that defines extremely unique geometry beyond a mere square and a circle found in the human form, for reasons that the book explores. The human form fits very mathematically into the centre of the stone circle at Stonehenge with the head positioned above the ‘altar’ stone. In a wider context… the solution becomes even clearer… because it turns out that Stonehenge and its surrounding monuments were designed as a star map of the heavens. A grouping of nearby manmade mounds replicates a prime star constellation explored in my work, while the outer stone circle’s geometry is suggestive of the outline of a star in conjunction with two smaller mounds mimicking planets in orbit (see Stonehenge page). Herschel believes that because the shape of the human form is very ingeniously linked to the star that their pyramid star maps isolate (found also at two other ancient sites), it seems the ancient civilisations were trying to tell us that their ancestors… the ‘gods’ came from one and the same star. One cannot help asking: Is this star suggesting the place of origin of the human gene lineage? A lineage evolved somewhere else completely independent to any Earth evolving hominid? 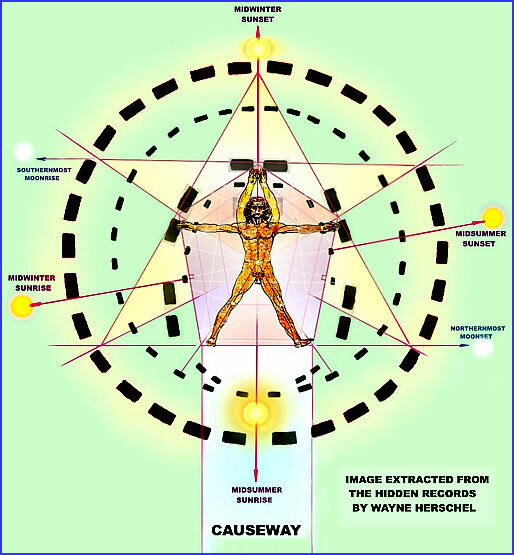 Is this human blueprint code part of a cosmic message? This has only been a cryptic analysis… only once you’ve read the wider parameters ‘The Hidden Records’ deals with, will you be able to evaluate it against all the thought provoking evidence. The message conveyed by the sketch seems to suggest that this sacred form is only part of an even deeper enigma. 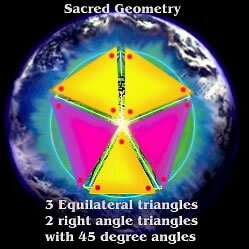 After all, why keep innocent mathematical geometry unique to the human form a secret? 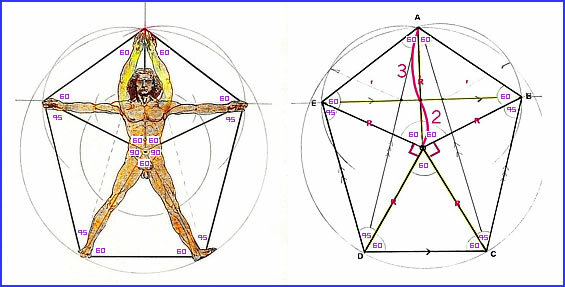 What if the geometry is part of a source of ‘forbidden’ knowledge that did not fit at all into religious teaching during the renaissance era? Da Vinci seems to have guarded this secret for this very reason. However, this did not detract from the likelihood that he believed the code was of untold significance to humankind and should not be forgotten. Hence he ingeniously encoded it into some of his paintings. But why would this knowledge have been so shocking for its time? Perhaps it claimed evidence of the place of human origins… evidence of which does seem to exist, gauging by what I had stumbled on in my research of ancient civilisations. If Da Vinci had exposed this phenomenal revelation, it would have defied the holy books of his time. Was it worth being burnt at the stake for doing so? Perhaps this knowledge Da Vinci had, claimed we were the descendant lineage from visitors of human form who came from the stars, who possessed powers that would very quickly be relegated to witchcraft. When in effect, what these beings that came from above possessed, was technology. Technology that was so advanced, it could be misconstrued as something evil by commoners… but certainly not by a genius such as Da Vinci. If one goes by this train of reasoning, one cannot help but wonder if all of Da Vinci’s inventions were not really his ‘inventions’ per se, but reproductions of what he had been privileged to bare witness to. Records of the hi-tech technology once used by those who visited… from another world? The secrecy surrounding the Da Vinci code now seems to be justifiable, as my controversial book, ‘The Hidden Records’ extrapolates. I reveal how this fingerprint of those who visited from another world, is encoded into the enigmatic monuments they built on Earth… and even on Mars (which was not always a red planet). This would explain why the code had been covered up for centuries… until today. ‘The Hidden Records’ will reveal all! Not only does it offer proof that the star the ancient monuments isolate in their layout plans is indeed the star of the ‘gods’, but that it exists astronomically. The book will offer corroborating evidence that it is Sun-like and very close to our solar system. The operative word here is ‘Sun-like’… because it would most likely have planets associated with it, conducive to life as we know it.